Posted on May 19, 2015 | Comments Off on Many Thanks for a Wonderful Celebration! We were blessed with a beautiful day for a beautiful celebration! Following the 9:00 Family Mass Celebration, families began to gather outside to enjoy breakfast or lunch as the kids played in the bouncy houses and delighted in balloon animals. 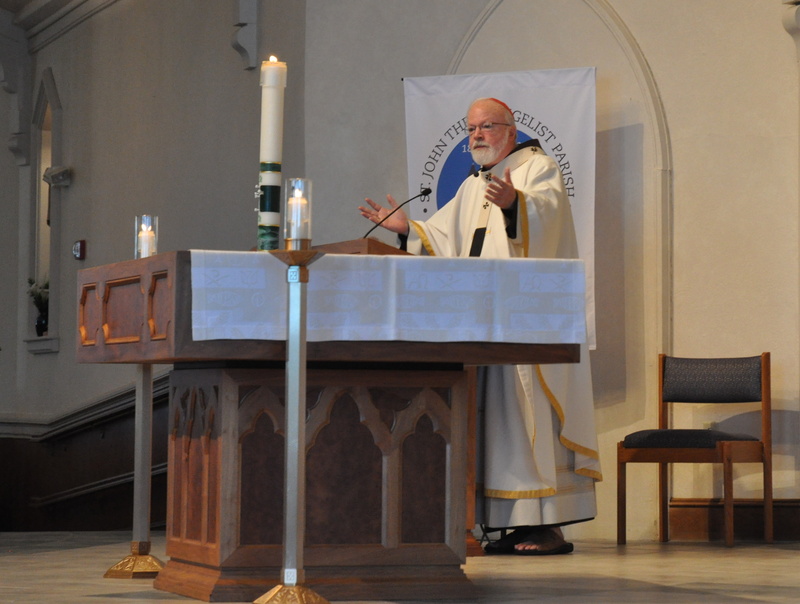 Our 11:00 Mass with Cardinal Sean O’Malley, concelebrated by Fr. Powers, Fr. Connelly, Fr. McMillan, and Msgr. Lind, was a prayerful and moving celebration of the life of our parish – past, present and future. To read the full version of our Parish History, which was excerpted in last Sunday’s bulletin, please visit the website. The audio from the 11:00 Mass, which will include the Cardinal’s homily and the beautiful music of our Parish Choir, will be posted to the website soon. A special note of thanks to all the parishioners who worked so hard to make St. John’s May Anniversary weekend a special time for all! We would especially like to thank the Anniversary Committee Members: Carolyn Anderson, Norm Boucher, John Calcio, Chrissy Cassa, Rose Mary Donahue, Mimi Eldridge, Janet Schreiber, Jim Stokes and Christine Tierney. With a special note of appreciation to Dorothy Cullinan who created the Anniversary logo that was so effective in focusing our attention towards both of St. John’s Anniversary celebrations in 2015. Also a note of thanks to all the vendors who participated in this parish event: Bank of America, Bon Me!, Burke’s Funeral Home, Captain Marden’s Cod Squad, Haynes Management, Peter’s Pizza, Roche Bros., Taylor Rental, Town of Wellesley Police Department and Whole Foods. This entry was posted in Anniversaries. Bookmark the permalink.